Just REMODELED Large Studio Deluxe with Air Conditioning. Sleep 40 feet from the ocean! PANORAMIC VIEWS/SUNSETS! 2 Relaxing Oceanside POOLS. Fully-equipped granite/stainless steel kitchen. GREAT LOCATION! Minutes to Lahaina, Kaanapali & Kapalua. Close to groceries, restaurants, beaches. TURTLES love this area. 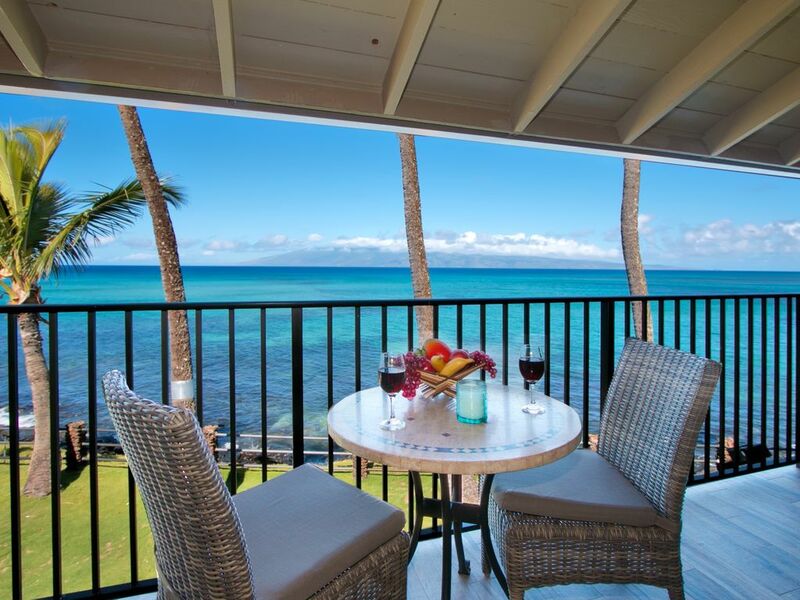 Relaxing Hawaiian setting located in the Noelani Condominium Resort right on the ocean. Boutique oceanfront 50-unit condo. Quiet and intimate. Queen-size bed and a sofa bed. Large fully-equipped kitchen. Large bathroom. Two oceanside pools and hot tub. Three gas BBQs on the ocean. Herb garden for spices. Free internet. Free laundry in building. Free parking. Beach chairs, beach towels, ice chest, binoculars provided. Our guests are our number one priority. While we do not live full time on Maui, we respond quickly to emails/calls and our on-island property manager is available for emergencies. Located in the condo is a detailed guidebook we created for our guests and an activities expert is available to help plan your vacation. Ocean is literally 20 feet from your lanai (balcony). Beach cove steps away, a small park, and then a stretch of beach. Turtles love this area and are seen daily right from the condo. Whales frolic right off the lanai (seasonal). Located right on one of Maui's top surfing spots (seasonal). Snorkeling steps away. Moloka'i and Lana'i views. Our favorite area on the island is upper West Maui, just north of Lahaina. We discovered Noelani Condominiums by visiting many of the complexes in this area and felt that this beautiful, well-kept 50-unit complex offered what we desired; serenity, spectacular oceanfront views, incredible sunsets, plenty of sunshine, cooling tradewinds, and sparkling pools on the ocean. To us Noelani is a unique and magical place. The most unique feature of our condo is viewing sea turtles 25 feet from our lanai. One becomes thoroughly entertained sitting on the lanai soaking up the incredible views or relaxing by one of the oceanside pools. Another unique benefit is that one of Maui's premier surfing spots is located right in front of our lanai. We have made a conscious effort to ensure that you enjoy the comforts of home in our condo. Please visit our website and virtual tour for additional information. Sandy cove next to property, then a small park, and then a long stretch of beach. Can all be viewed from the lanai. 180 degree ocean view. Condo is 20 feet from the ocean. One of the few units on Maui this close to the ocean. Surfing, snorkeling, fishing, whale watching (in season) and sea turtles right in front of the condo. Shared with others within building. Free. Free off-street parking. Very close to unit. All towels provided including beach towels. Studio Living - bed, night stand, sofa, TV, side tables, lounging chair, dinette table. Salt, Pepper, some Seasonings. Fresh herbs in garden available. Fully equipped to make meals and full-sized appliances. Library at Hale Aloha by Pool. Tropical garden. Fresh herb garden for your convenience. Large patio for the whole complex with BBQs, lounge chairs, tables, chairs. Free parking, no resort fees, two oceanside pools w/ hot tub, free wireless internet, picnic area, herb garden for cooking, MP3 music adapter. Beautiful updated condo with the sights and sounds of the sea as soon as you enter. The owners have attended to all the details. It’s perfect! Beautiful view! The studio was the perfect size for the two of us. Very nicely remodeled & organized. All of what you would need to cook meals if you so desired. There is a small beach next to the building so that you don't have to go far to relax. Our favorite part was THE TURTLES!!!!! We could see them daily right from the Lanai. We definitely chose the right island and place to celebrate our 30th wedding anniversary. Hope to return sometime in the near future!!!!! What a wonderful way to celebrate and create lasting memories! We also love watching the entertaining turtles and the sun setting between Lanai and Molokai. Mahalo for your review! We welcome your return. We spent our anniversary at this condo which was also our first time in Hawaii. I don't think that we could of had a better time. From watching the turtles on the lanai, snorkeling at the nearby beach or watching the amazing sunsets every night. Thank you for sharing your place with us! My family and I stayed at the Noelani and absolutely loved it! The location is GREAT because it's just a short drive to many local beautiful beaches, Lahaina Town and many other things. Our unit was very clean and had everything we needed - right down to ice chests to take to the beach - and the kitchen was well appointed. The office also loaned us boogie boards for the duration of the stay which was very convenient. The two pools and hot tub were great - so close to the ocean and never crowded. Watching the sunset from this location was wonderful, and an added bonus is that many sea turtles swim directly in front of the Noelani so you can always see them bobbing around. I was worried about renting a place that didn't have a beach directly in front, but I ended up preferring it. It was nice not to have people walking by along the beach all the time, and the beach that is just adjacent to the Noelani is a great little beach to just hang out at and go for a little swim with some turtles. The staff were all very friendly and accommodating. I would definitely recommend this place to anyone and would love to go back! It really felt like our home away from home during our stay. This property has an exquisite view and very helpful facility staff. It's the perfect size condo with its own kitchen. My friends and I checked in one evening and enjoyed a simple sunset dinner. Breathtaking coloring. Just a tad north of Lahaina, the complex is happily situated with access to a few shopping areas for necessities. We certainly enjoyed the pool and hot tub. After our travel packed days hiking and scurrying about, being able to come back and relax was a great feeling. Thank you for the orientation breakfast and wonderful stay - hope to be back! A 50% deposit is due through VRBO upon booking to confirm your reservation . The balance is due 45 days prior to arrival. Check-in is 3pm. Check-out is 11am.